When Muffin and Squeaker were born, Nomi and I were delighted that they were twins. Yes, those first few months were rough, especially when it came to getting enough sleep. But having twin girls means that for their entire childhood, Muffin and Squeaker will have a constant playmate in their lives—each other. Both Nomi and I have siblings, and we always intended to have more than one child. We felt that it was important for any child of ours not to be alone. Personally, I always wanted two, as I grew up as a middle child. (Interpret that as you will.) By having two children at once, we felt that the kids could avoid the issues that come with having either an older or younger sibling. In fact, I’ve made a point of not telling the two of them which one was born first. (Not that they’ve asked.) And already, we’ve seen the benefits that the two of them enjoy from being twins, as they share a very close bond, almost never wanting to be apart from each other. As wonderful as it is that Muffin and Squeaker are best friends, we wanted to make sure that they socialized with other children as well. Many of our friends with kids live a bit far from us, though, and it’s hard for us to get to them without a car. Fortunately, living in Brookline means that we also have many friends with kids who are but a T-ride or a short walk away. 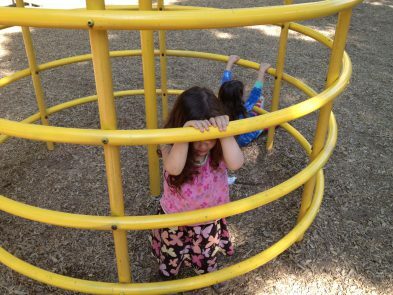 I’ve written before about the importance and difficulty of keeping the kids occupied. As tempting as it can sometimes be, I don’t want to plunk them in front of a video screen all day. So we try to figure out plans for the weekend as early as possible, so we don’t fall into the trap of just keeping the kids home all day. Recently, our go-to family for playdates has been the family of fellow writer Leah Cypess. Leah and her husband live a short T-ride away from us, and they have three children, including one daughter who is but eleven days older than our kids. On many Sundays, we will bring Muffin and Squeaker over to play with Leah’s children; they get a chance to play with different toys and read different books from what we have at home. Also, Leah and her husband often feed us lunch or dinner, giving Muffin and Squeaker a chance to learn how other families treat mealtimes. Having all our kids together means that they tend to play together, leaving we parents mostly free for actual minutes at a time as opposed to merely seconds. To open up regular opportunities for socialization, we enrolled Muffin and Squeaker in Sara’s Playgroup this past academic year, as it gave them a peer group with which to interact. I didn’t quite realize how close our kids were becoming with their friends, though, until a chance encounter at Longwood Playground. We were on a playdate there with the Cypess kids when Muffin and Squeaker started shouting over and over and another little girl ran up to them shouting their names. It turned out to be one of their friends from playgroup, and the three of them were so happy to see each other that they chased each other in circles for what seemed like half an hour. If Muffin and Squeaker are developing such close friendships at such a young age, we must be doing something right with their playdates. We hope they continue to maintain similar relationships as they get older. About this column: The adventures of two Brookline parents and their twin daughters, Muffin and Squeaker. This column originally appeared on the Brookline Patch website. Copyright 2012 by Brookline Patch. This entry was posted in Columns and tagged childhood development, friendships, playdates, playdates with toddlers, toddler friendships. Bookmark the permalink.